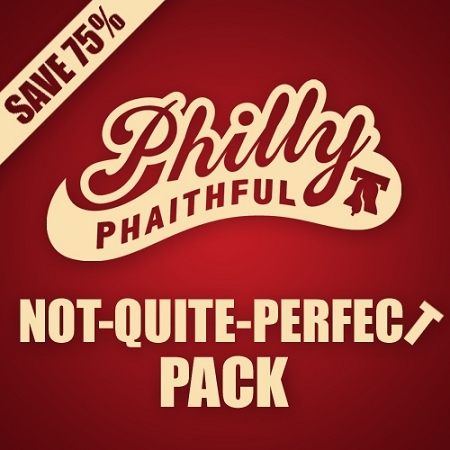 Want to score your favorite Philly Phaithful tee at a fraction of its retail price? Look no further, astute shopper. Each Not-Quite-Perfect Pack includes 3 shirts with small imperfections; either a tiny hole, a misplaced marking or a seam that needs repair. These shirts are perfect for gym tees, football Sundays or someone who can sew. Great tees. Small imperfections. Big savings. You are only limited by your imagination...and your desired shirt size. If you have any requests for shirts (by sport, color etc), please include them in the comments section and we will do the best we can to fill from the limited inventory. If your request isn't available, a non-damaged, clearance item will be included in its place. *Please note there are no exchanges or returns on items in the Not-Quite-Perfect Pack.